I am pleased to present the book I.S.C. 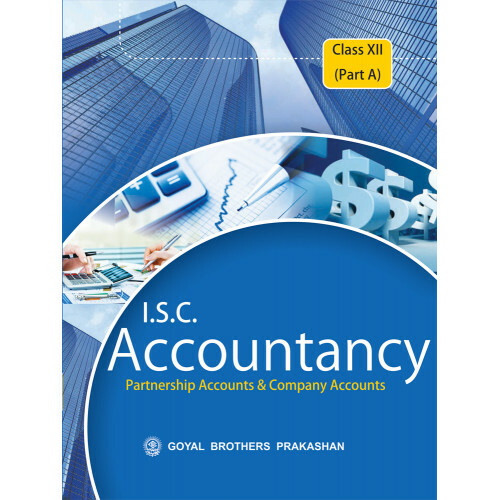 Accountancy–XII (Part A). The book covers the latest syllabus of the class XII of the Council for the Indian School Certificate Examination, New Delhi for I.S.C. Examinations. As a teacher of the subject for many decades, I have interacted with the students of accountancy. During these interactions I noticed a general lack of comprehension of the basic concepts and principles of accountancy. Keeping the problems of the students in mind, I have tried to explain and illustrate the fundamental principles on which the subject of accountancy is based in a very simple and easy manner. A very simple and lucid language has been used throughout the book. The entire foundation of the book is based on the basic accounting systems and concepts. These concepts and systems have been explained and illustrated properly with suitable examples from everyday life. The illustrations have been properly graded and arranged in order to enable the students to move from easy to difficult propositions. The discussions and explanations are just to the point and have been presented in an intelligible manner. The explanation of the complex situations are immediately followed by suitable illustrations to bring home the important points. For revision, recapitulation and better grasp of the subject a large number of test questions and practical exercises have been given along with suggested answers at the end of each chapter. A large number of problems have been included chapterwise from past years’ Question Papers (till 2015). A unique feature of the book is that the solutions to every practical illustration are preceded by a detailed ‘Accounting Technique’ to be followed in solving the problem. This ‘Accounting Technique’ approach makes it very easy for the students to understand the solutions to the problem. The ‘Accounting Technique’ lays down the step-wise approach to solve the problem. The book is meant for all sections of the students, i.e., the brilliant, the intelligent, the average and the weak students. The weak students can start from the simple illustrations and problems and go upto higher levels in a systematic way. Though every effort has been made to present the entire text in an error-free manner yet some deficiency may have inadvertently crept in. I shall be highly grateful to the readers of the book, if such deficiencies are pointed out to me for further improvement of the book. I am extremely grateful to my colleagues and all those who have helped me a lot in bringing out this volume of the book. My Book Of Life Skills With Values Teachers Resource Book 5..